Molecular oxygen (O2) changes its form dramatically with compression, transforming to a solid with spectacular colors, and eventually becoming metallic and superconducting at sufficiently high pressures. The underlying mechanism for these remarkable phenomena has been a source of debate for decades, in particular the origin of the recently discovered molecular cluster (O2)4 in the dense solid, red phase. 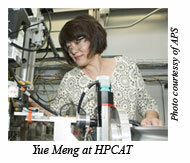 Yue Meng (HPCAT), and researchers from the Geophysical Laboratory, University of Chicago, University of Saskatchewan, and the National Synchrotron Light Source found that under pressure the individual molecules interact through their outermost, highest energy molecular orbitals. This pairing interaction brings four oxygen molecules together to form discrete (O2)4clusters at a pressure of about 100, 000 times atmospheric pressure, or 10 gigapascals. 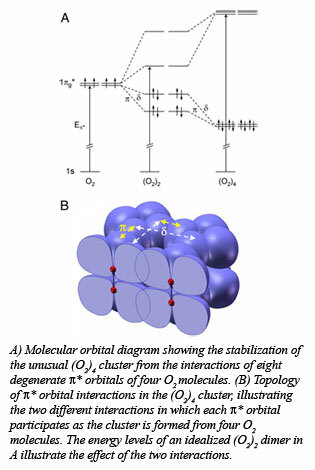 With increasing pressure, the effective radial extent of the molecular orbitals on individual molecules increases, promoting the interaction of unpaired electrons on adjacent molecules.